I'd love more ideas. What works for you? 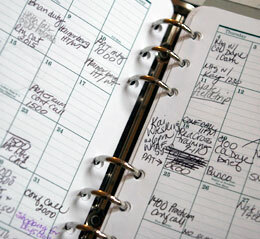 What makes managing your family schedule a breeze? or at least less of a hurricane then we are experiencing. I really do think that sports are important for my boys. They are getting exercise, time with new-friends, and learning the value of team-work. I really like their coaches and so sports brings new role-models in their lives as well. So I'm not ready to cut things out. Hopefully this soccer / baseball overlap will end soon but we've had so many soccer cancellations because of rain that I think we'll be playing both sports until August at this rate. OYE! Until then you can find me in the kitchen yelling cheering "Go Go Go. Let's get out the door"; behind the steering wheel trying to remember which field we are supposed to be at; or my favorite place of all three: on the sidelines cheering for my favorites sports-stars!